Carpet flooring is the ideal option for many busy families. There are so many modern options available to give your home that unique flair you’re looking for, plus there are various features that are available to make your life easier with carpet flooring. Consider upgrading a room or two in your home with carpet from Monarch Carpet, Drapery & Upholstery – you won’t regret it for a second! You’re going to love your gorgeous new carpet from Monarch Carpet, Drapery & Upholstery. Learn more about carpet below, and call us at (877) 766-6272 to schedule a free in-home consultation and get an estimate. 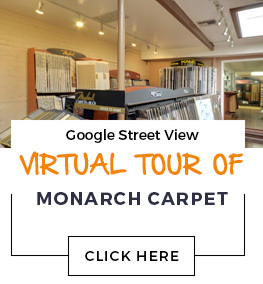 Or simply come to our store, which is conveniently located at 3007 West Temple Street Los Angeles, CA 90026 to check out carpet samples in-person and speak with our helpful carpet experts. For many people, the idea of carpet brings up a sense of dread. They picture old carpet styles that were difficult to clean and therefore, unsanitary and super stinky. Gross! But the good news is that modern carpet styles aren’t like that. Many of them have stain, odor, and static-resistant properties for maximum durability and comfort. You’ll be able to depend on your carpet to look and smell good for many years when you choose to purchase it from the carpet experts at Monarch Carpet, Drapery & Upholstery. Each room in your home has a different vibe and various purposes. The kids’ bedroom doesn’t have the same vibe or purpose as the mudroom or the basement, for instance. So when you’re thinking about which style of carpet would be best for each room you plan to upgrade, you might start to feel a bit overwhelmed by all the options. There are thousands of carpet styles, patterns, styles, and textures available, and plenty of custom options, too. But don’t worry! We are here to help you. Our flooring experts have helped so many people just like you figure out which carpet style is the best choice for their particular space. We have plenty of carpet styles that will work well for your space, and we’ll help you narrow down the options so you can pick one that you’ll be thrilled with for many years to come. We have what you need, and the expertise to help you find it, at Monarch Carpet, Drapery & Upholstery. Call or come see us today to get started! Aside from the style versatility of carpet, there are many other reasons why people pick it for various rooms in their homes. Carpet can be installed over any existing floor, including damaged areas. Plus it can help absorb sound, so it’s ideal for homes with high ceilings and rambunctious kids. In fact, some carpet options are even eco-friendly because the fibers are natural or recyclable. Give us a call at (877) 766-6272 or come see us to find out more about carpet and decide whether it’s the best choice for your property. Come see and touch some carpet samples before you buy! We are located at 3007 West Temple Street Los Angeles, CA 90026 and business hours are Monday–Friday 7:00am to 5:00pm.